Enter the world of PictureBook Games: Pop-Up Pursuit, and enjoy a family board game set in a pop-up picture book. Instead of simply rolling dice to move along the map though, you use cards (that can help or hinder progress) and coins (useful for buying more cards, but don’t forget about your Coin Bonus at the end of the game). In addition, you’ll find that the spaces on the map play an important role in the game’s outcome and that your computer-controlled opponents exhibit different personalities and behavior. And if that’s not enough, the mysterious Book of Magick will occasionally be opened, causing an event to occur—which may change according to how you play. 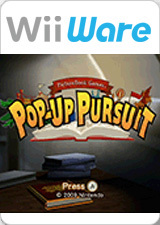 This mixture of exciting game play combined with a charming and artistic atmosphere gives Pop-Up Pursuit high replay value and a unique depth—even if its characters are flat! The graph below charts the compatibility with PictureBook Games: Pop-Up Pursuit since Dolphin's 2.0 release, listing revisions only where a compatibility change occurred. This page was last edited on 22 January 2018, at 04:35.